The Gunpowder River is flowing at 37 CFs and is 55 degrees at the Falls Road bridge. Wet wading is an option in the shin to knee deep water, as air temps reach the upper 80s and 90s. 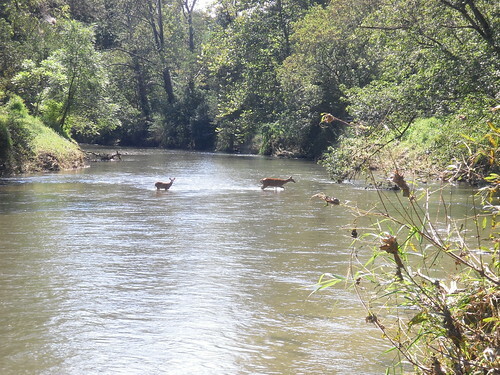 Conditions in the upper miles of the Gunpowder are similar to spring creek fishing. Low, clear water and wary browns require stealth, long leaders and delicate casts. The anglers who enjoy sight fishing will find the trout are easy to spot in these lower flows. While walking the river I spotted dozens of trout, and quite a few browns in the 10-15 inch range. In many cases the browns were holding close to the bank in very shallow water. I also noticed some trout holding a few inches under the surface, inspecting small insects floating past. Small midges, BWOs and trico patterns are catching trout on the surface. Zebra midges, WD-40s, and other similar patterns sized 20-24 under small indicators work great in riffles. The shop recently received a large shipment of hoppers, beetles, and various ant patterns that will produce over the next few months. In the latest video post I filmed a number of browns in shallow water, and a great blue heron looking for a meal in a riffle. This entry was posted in fishing report, video on June 26, 2010 by Jason du Pont.